Any significant loss brings with it profound grief. Most people don’t realize the difficulty however in the recovery to follow. Most people see the grief as linear and by that I mean that they feel each day they should be a little better. 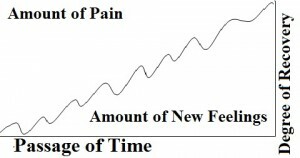 Healthy grief however looks a little bit more like a roller coaster ride as shown in the picture below. 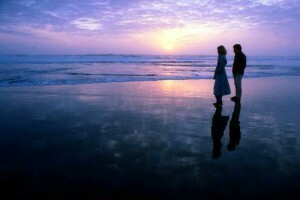 Grief tends to come in waves much like the tides of the ocean that come in and then go back out. The reason that our feelings tend to cycle through like this is because of how important what we had was to us. When the loss is significant enough like the death of a spouse, the loss of the marriage, or a breach of trust in a committed relationship, we tend to be hurt in proportion to how much we gave of our heart and soul in those relationships. In other words, the deeper the love the more profound the pain in our grief. While this kind of pain can be deep and lasting, it is a positive indication of how deeply we can love in our lives. Sometimes just this simple knowledge can be a reassuring companion during the hours of struggle and tearful despair. For many the saying “one Day at a Time” can literally be measured one minute at a time when the pain is deep enough. As a person recovers from their loss however they will find that they invest themselves more and more into the possibilities and hopes for the future. This will not be immediately obvious but should be a growing part of our awareness as we begin to let go of the past. This is not to say that as we begin to feel better, there will not be times regression. Regression is often a measure of the multitude of memories and reminders of the important aspects of our previous life. 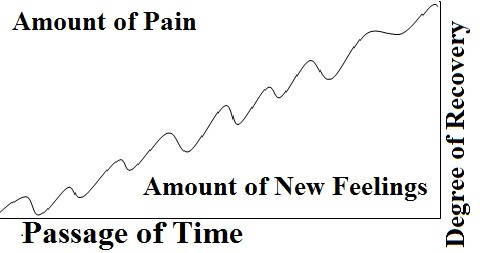 While there may be brief spikes of hurt and loss as intense as when we first found out, those recovering from grief will find that their experiences of loss will become less intense and last for shorter and shorter periods of time as they emerge out of their sorrow. 2) Accept the moods and mood swings that go with the loss. Cry if you need to cry, be sad if you need to feel sad, be alone if you need, etc… We all have rituals that allow us to embrace our hearts and soothe them. This means don’t run from your feelings, especially at first. In some loss we may even be mourning the death of a hope or dream that we had been counting on. Reflect on those ideas and what they had the potential to mean to you. 3) Coping with pain is a very individual endeavor. For some, journaling to hold onto important memories, thoughts, feelings may be a way of honoring the past. For others it may look more like putting away mementos, pictures, or tokens of our heart’s treasures. Talking with loved ones and sharing memories can ease the loss, too. In one story I know of, a client told her therapist that everytime she made her beloved aunt’s pineapple upside down cake she had a treasured reflection and warm memory of their relationship. Some need to move away from reminders, others will want to embrace them. Allow yourself to do what fits for you. 4) At first you may have to go through the motions to get through your day to day life, but this is normal. Go through the motions, allow yourself to feel numb, detached, but reengage in your life anyway. Depression is normal, and a healthy part of recovery. The first waves of crushing depression can last months, but should begin to subside with some days in there where you forget to feel depressed, even if you don’t feel happy. Getting back to your life will automatically begin to create the new you & new experiences, new memories will begin to take up more emotional room in your heart & mind to begin the healing. 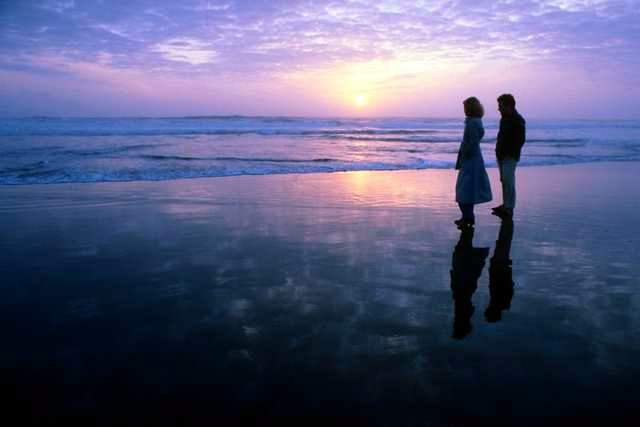 4) As the pain becomes less shocking and more a part of your life, look for ways to redefine your life with it’s loss, into a new one with new memories, new relationships, and a new you. I have told those grieving the death of a beloved parent that while they could never replace such a long standing and powerful relationship, they may be able to find parts of that special parent in an aunt or uncle, a neighbor or best friend. Honor that past with moments that build upon everything you’ve been given. You will have mixed feelings at first, but eventually you may find that the precious moments of those times in the past become special times in the present. 5) Finally, if you grief persists and you feel your life is grinding to a halt, too much, there are a number of books on the various losses, and the stories & help in the pages of self help can be tremendously comforting & reassuring. Also, Hospice has a presence in most communities, and they more often than not have support groups specific to the losses you experience. There are many issue specific in-person recovery support groups out there and many blog support groups for those who may feel more private. Persistent grief may even require meds, and many doctors, including family doctors have become quite comfortable prescribing anti-depressants. In the end the only mistake you can make is to quit your life. So get living and breathe again to honor the love that you’ve lost.